I arrived at theÂ National Museum of Nuclear Science & History to find Museum Director, Jim Walther, and Deputy Director, Greg Shuman, working tirelessly painting an exhibition space for the upcoming show “Art of the Reactor.” Jim extended me enough time to show some new collection additions, including a Delorean, which fit nicely in the “Pop Culture” gallery and explained how he has spent the past few days fielding media inquiries regarding the “hydrogen bomb” and its potential repercussions. 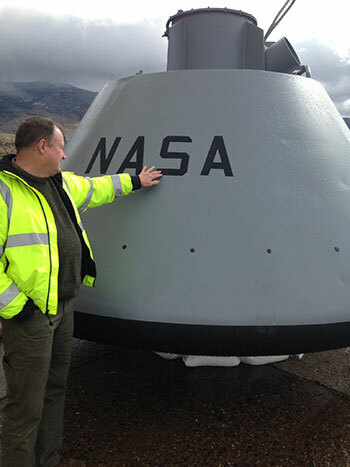 Chris highlights the Apollo Capsule (NASM) and details the story behind the lettering on the capsule. Friday, I woke up early to begin my three hour drive through southwestern New Mexico to Alamogordo, site of the New Mexico Museum of Space History and home to over 30 artifacts from the National Air and Space Museum (NASM). I found Chris Orwoll, Division Director, at the Museum Support Center, appraising a huge collection donation from California. Chris showed me the lunar rover from NASM and explained the details for the restoration project, scheduled to be completed in 2017. Chris took me to the main museum complex, located in the foothills of the Lincoln National Forest andÂ provides a magnificent view of the Tularosa Basin, home of Holloman Air Force Base and White Sands Missile Range. 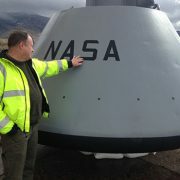 Chris highlights the Apollo Capsule (NASM) and details the story behind the lettering on the capsule. The culmination of my visit ended with a series of events at one of our newest Affiliates-New Mexico Museum of Natural History and Science for the opening of the “Post Diamond Tiara” exhibit. A year in the making, the Post Diamond Tiara, on loan from the National Museum of Natural History (NMNH), was unveiled by new Executive Director, Margaret (Margie) Marino toÂ the “oohs” and “aahs” of the excited crowd of volunteers, donors and general public. The events were capped with the formal presentation of Certificate of Affiliation. The Post Diamond Tiara excitement will continue on March 15, when NMNH curator, Jeffery Post, will present a lecture on this and other artifacts of the NMNH gem collection. My flight home allowed me to reflect on my stay in New Mexico and as with so many other trips, I understood and appreciated all the hard work, energy and enthusiasm the Affiliate staff members put into maintaining and showcasing their partnership with the Smithsonian. The reward was seen on the faces of the visitors seeing a thousand glistening diamonds for the first time and an appreciative smile came across my face. So if you find yourself in New Mexico or any of the other 44 states where Affiliates reside, I encourage you to stop in and put a smile on your face. 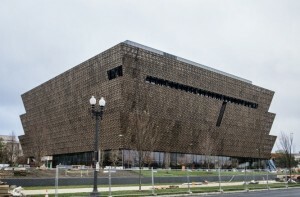 Scheduled to open on September 24, 2016, the National Museum of African American History and Culture will be the Smithsonian’s newest addition to its campus on the National Mall.Â Activities to commemorate and welcome the new Museum are being planned around the Smithsonian, to include special events and exhibitions that celebrate the African American experience.Â We’d like to get Affiliates in on the action too! Is your organization planning anything special in September that might coincide with the celebration?Â We’ve also been brainstorming additional ideas for Affiliates – could you host a speaker (even via webcast? ), display African American objects from your collection, display a banner or postcard, help us blanket social media channels?Â What other activities might be meaningful to your community that we can provide, or collaborate on, to make the opening of the Museum unforgettable? Please send your ideas to affiliates@si.edu and thank you in advance! MassBay Community College and Framingham State University (Framingham, MA) have received a $5,000 grant from the Sudbury Capital Grant Fund for the new MetroWest College Planning Center. The center has been set up to improve college readiness, participation, and completion among underserved student populations and nontraditional adult learners in the region. The National Civil War Museum (Harrisburg, PA) has been awarded a $50,000 grant from the NRA Foundation. The funds will be used to construct a new exhibit recognizing firearm manufacturers of the Civil War era that are still in operation today as well as highlighting gun safety programs and firearm education and training offered through the NRA. Jose Santamaria, Executive Director of the Tellus Science Museum (Cartersville, GA), was recognized with one of the most prestigious awards – Museum Professional of the Year – during the Georgia Association of Museums and Galleries, for his service to the museum industry. The Board of the American Jazz Museum (Kansas City, MO) announced that Cheptoo Kositany-Buckner has been named executive director of the museum. The board of directors of Conner Prairie Interactive History Park (Fishers, IN) announced the hiring of Norman O. Burns II as President and CEO. Burns succeeds Ellen M. Rosenthal, who retired from the museumâ€™s top position on January 4 after 12 years at the helm. Those who attend in person will have the opportunity to engage with faculty and other attendees during networking lunches and evening receptions at the Getty Center and the Los Angeles County Museum of Art.Â We are grateful to this yearâ€™s sponsors for their support of this rich program and exciting receptions, along with complimentary transportation to and from the Getty Center and LACMA. Undersecretary for Museums and Research Richard Kurin will give a lecture on the Smithsonian’s History of America in 101 Objects followed by a book signing at the Museum of American Finance in New York, 2.10. National Museum of African American History and Culture curator Dr. Joanne Hyppolite will talk about their new museum at HistoryMiami in Miami, 2.11. National Museum of African Art curator Christine Kreamer will give a talk on African Cosmos: Stellar Arts in the Stars of the Smithsonian lecture series at Mystic Seaport in Mystic, 2.11. Undersecretary for Museums and Research Richard Kurin will give a lecture on the Smithsonian’s History of America in 101 Objects followed by a book signing at the North Carolina Museum of History in Raleigh, 2.16. The Reginald F. Lewis Museum of Maryland African American History and Culture will host a screening of the Smithsonian Channel’s new documentary series, Major League Legends with a film on Hank Aaron in Baltimore, 2.17. Several Affiliates will host screenings of the first installment of Major League Legends, a new documentary series, starting with a profile of Hank Aaron, produced by the Smithsonian Channel and Major League Baseball. The African American Museum will host a screening of the Smithsonian Channel’s new documentary on Hank Aaron in Philadelphia, 2.18. The Heinz History Center will also screen the Hank Aaron documentary in Pittsburgh, 2.29. Affiliations director Harold Closter will give remarks at the Asian Festival hosted by the Institute of Texan Cultures in San Antonio, 2.13. The Museum of History and Industry will host a screening of the Smithsonian Channel’s new documentary on Hank Aaron in Seattle, 2.22. 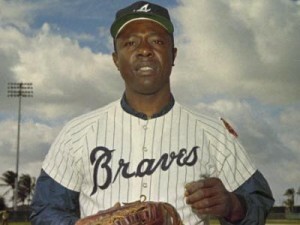 History Colorado will host a screening of the Smithsonian Channel documentary on Hank Aaron in Denver, 2.23. IndiVisible, a Smithsonian traveling exhibition on African-Native American Identity, is set to open at the Agua Caliente Cultural Museum on January 19 in Palm Springs. Photo: Jay Calderon/The Desert Sun. This community added a couple of feathers to its cultural and tourism caps this week when the Smithsonian Institution, the largest and, arguably, best network of museums in the world, named our Dubuque Museum of Art a Smithsonian affiliate. 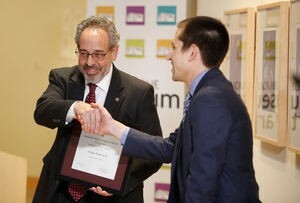 Harold Closter (left), director of Smithsonian Affiliations, and David Schmitz, executive director of the Dubuque Museum of Art, mark the local museum’s designation as a Smithsonian affiliate. The Dubuque Museum of Art will join The National Mississippi River Museum & Aquarium as a Smithsonian Affiliations site. 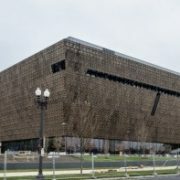 â€œNot everybody can come to the Smithsonian and Washington D.C. to see things, so if you canâ€™t come to us, itâ€™s our objective to bring the resources and come to you,â€ said Aaron Glavas, Smithsonian outreach manager. History Colorado has been making some history of its own over the past six months, with a complete reconfiguration of the board to make it leaner and meaner (at least when it comes to financial matters), buyouts and layoffs of staffers, and the departure of many of the organization’s top managers, including state historian Bill Convery. Dr. Richard Kurinâ€¦offers a new perspective on American history, explaining how objects end up in the Smithsonian collection and encouraging us to reconsider objects we think we know and understand. 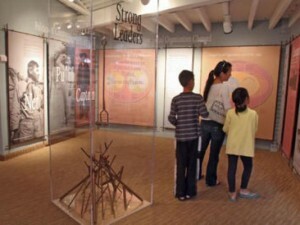 â€¦the museum is currently working with 10 partner organizations as well as the Smithsonian Latino Center and the Smithsonian’s National Museum of African American History and Culture to carry out the “Latinos and Baseball” initiative: California State University, San Bernardino; California State University, Channel Island; California State University, Los Angeles; The Institute of Texan Cultures at the University of Texas, San Antonio; the Kansas City Museum; LA Plaza de Cultura y Artes in Los Angeles; Los Magnificos Film in New York; La Casita Cultural Center at Syracuse University; the University of Illinois, Urbana-Champaign; and the “Sugar Beet Fields to Field of Dreams, 1920s?1960s, Mexican/Spanish Contributions to America’s Favorite Pastime” traveling exhibition based in Colorado and Wyoming. Carlene Stephens, curator at the National Museum of American History, will present â€œConnecting the World in Timeâ€ at the Mystic Seaportâ€™s Stars of the Smithsonian Lecture Series. Programs are at 1:30 p.m. and 7:30 p.m. Jan. 14 at the River Room, Latitude 41Â° Restaurant & Tavern. In commemoration of the important history of Asian and Pacific Americans, Cerritos Library will present the exhibition â€œI Want the Wide American Earth: An Asian Pacific American Storyâ€ from Sunday, January 3 through Sunday, February 28, 2016. 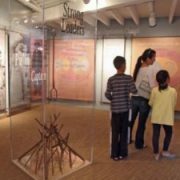 The exhibition was created by the Smithsonian Asian Pacific American Center and the Smithsonian Institution Traveling Exhibition Service (SITES) and is part of a national tour. 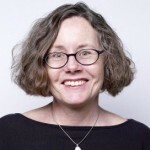 https://affiliations.si.edu/wp-content/uploads/2016/01/aguacaliente-300x225.jpg 225 300 Elizabeth Bugbee https://affiliations.si.edu/wp-content/uploads/2019/03/si_Affiliations_rgb_single-line_color-280w-1.jpg Elizabeth Bugbee2016-01-25 12:19:242017-03-10 17:51:00affiliates in the news!